From 12-14 June, albis-elcon presented its latest products and solutions in the areas of Network Migration, IPTV, Energy Management, Gigabit Access & Backhaul and Network Management to its visitors at the ANGA COM 2018. 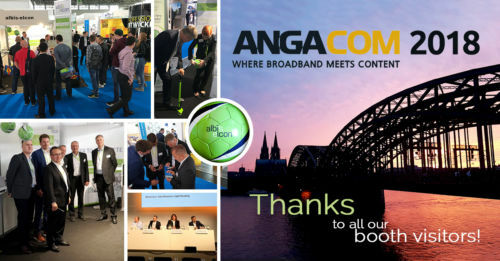 In addition to numerous discussions on various possible uses of our products, there was another highlight for our visitors – an albis-elcon football. Here it was necessary to pump up their own ball as fast as possible with an air pump and of course, to keep. The record holder on the last day of the trade show can now look forward to 2 RB Leipzig VIP tickets for a match of his choice in the coming football season. Many thanks for the numerous participation and the sometimes fierce competitions. We had a lot of fun and great discussions with you! Now we look forward to the upcoming trade show participations in autumn – the MEF18 in Los Angeles and the Broadband World Forum in Berlin. albis-elcon supplies communication service providers with products and systems for fiber and copper data transmission and power feeding to enable broadband network deployment, IP network migration, and Internet TV distribution — all of which are fully managed and software controlled. With 15 million installed devices in more than 40 countries, the company is well-positioned to deliver superior-engineered hardware, software, network management, and implementation services.